Duct Cleaning Scottsdale AZ 623-466-8625 - North Phoenix and Deer Valley duct cleaning specialist, commercial and residential air duct cleaning, HVAC system maintenance and vent cleaning service, Call DUCTZ indoor air quality professionals for heat duct cleaning and HVAC system restoration services. Smart people do not rely on an unlicensed doctor for their physical health so why would they trust their most important investment to an unlicensed home service provider? Scottsdale AZ – The local air duct cleaners with DUCTZ stand out from the competition, but not for the reason some would think. They do not claim to be the cheapest, but their workmanship is superior to that of a discount duct cleaning company advertized on cheap flyers. Service technicians with DUCTZ keep pace with the industry and hold the specific license required to perform HVAC system maintenance and air duct cleaning service. Professional duct cleaning service can be vital to healthy indoor air quality. DUCTZ service technicians are trained and certified by NADCA, the National Air Duct Cleaners Association. NADCA is a not-for-profit trade association that serves the HVAC inspection, maintenance and restoration industry. With over 1,000 member companies from more than 20 countries NADCA serves as the focal point of the global industry. Vince Divarco owns DUCTZ of North Phoenix and Deer Valley (http://www.ductcleaningscottsdaleaz.com/), providing air duct cleaning, HVAC system cleaning and restoration service, dryer vent cleaning and carpet cleaning in homes and businesses. Families who are moving into a new home or just tired of their allergies flaring up whenever the furnace is operating can trust DUCTZ to clear the air. DUCTZ air duct cleaning and indoor air quality specialists are the industry leaders to trust for HVAC system maintenance. In the warm, dusty climate of Arizona, duct cleaning is recommended to remove dirt, dust and pet dander from heating and air vents. Customers who call DUCTZ enjoy great service from a family owned duct cleaning company that treats all their clients with the highest level of dedication and professionalism. DUCTZ of Phoenix service technicians are licensed (K-05) and authorized to perform HVAC system and air duct cleaning in homes and businesses. Service technicians are happy to show their customers verification of proper licensing to perform duct cleaning service. Scottsdale, AZ – The duct cleaning service team took quick action, responding quickly to restore indoor air quality after a fire at the La Petite Academy last winter. Vince Divarco, owner of DUCTZ responded immediately, and his team was onsite within 3 hours of the call. The HVAC restoration and duct cleaning crew worked through the night to restore clean air to the school. Two DUCTZ emergency response teams arrived on the scene and went right to work to restore indoor air quality in classrooms and nearby offices. All HVAC cleaning and restoration to the 4 affected HVAC systems was done according to DUCTZ high standards and strict protocols. DUCTZ of North Phoenix and Deer Valley (http://www.ductz.com/phoenix-deervalley) opened in 2007 to provide air duct cleaning and indoor air quality solutions for homes and businesses in Maricopa and Pima Counties. The local duct cleaning experts adhere to National Air Duct Cleaners Association standards and EPA guidelines as they clean and restore air ducts and HVAC systems. DUCTZ provides commercial and residential duct cleaning service for anyone with a heating and cooling system who may be concerned with the quality of air they breathe. Health benefits include elimination of allergy triggers that cause asthma or other respiratory related ailments. Regular air system cleaning can extend the life of the heating and cooling equipment and save the customer thousands of dollars in utilities and repair or replacement costs. Owner, Vince DiVarco, takes pride in giving the best duct system cleaning service available. His service technicians are trained in the latest air duct cleaning and HVAC restoration techniques. Cleaning a ventilation system and doing the job right the first time is top priority. 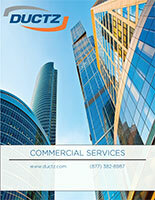 DUCTZ ensures customers they are getting the high-quality HVAC restoration and air duct cleaning service they deserve. Visit http://www.ductcleaningscottsdaleaz.com/ to learn more. NADCA Certified - What does this mean to you?